Oh, how strong and silent! “ok! who took my teddybear!” lol! Hey Arwen, check out my cool new leather jacket! Arwen: WHAT HAVE YOU DONE WITH ASFALOTH?!! oh, this is the one that was with the Empire LOTR Collectors Edition…i got it on my wall. Aragorn’s the best! 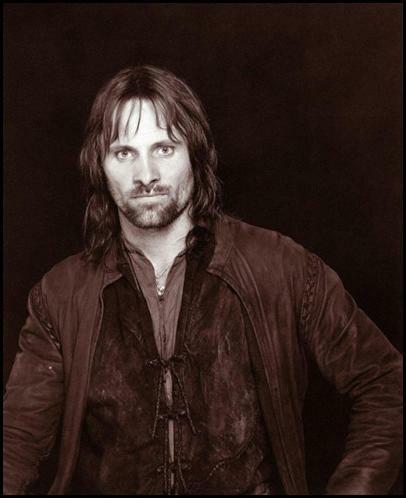 Viggo Mortensen was a perfect choice! I love Aragorn and Viggo. But i have one question. If he is a ranger, why is he so clean? I like him when he’s not covered in blood and sweat. I love being Arwen’s sister. This means if she dies I’m her perfect twin! FORGET BLONDIE! YOU HAVE ME! Has anyone heard that Aragorn has rencently bought a Harly with the symbols of Elendil on it? he kinda looks like a cowboy. LOL! Blackandwhite pic? A version that compares to Leggy’s own aristocratic pic! He looks startled! That is so typical. Nobody likes the danish guy! This is a very nice portrait, picture of Viggo.